My toddler is getting more and more interested in letters, numbers, shapes, and colors, so we've been doing a few learning activities lately based on her interests. I'll be sharing many of these activities with you. 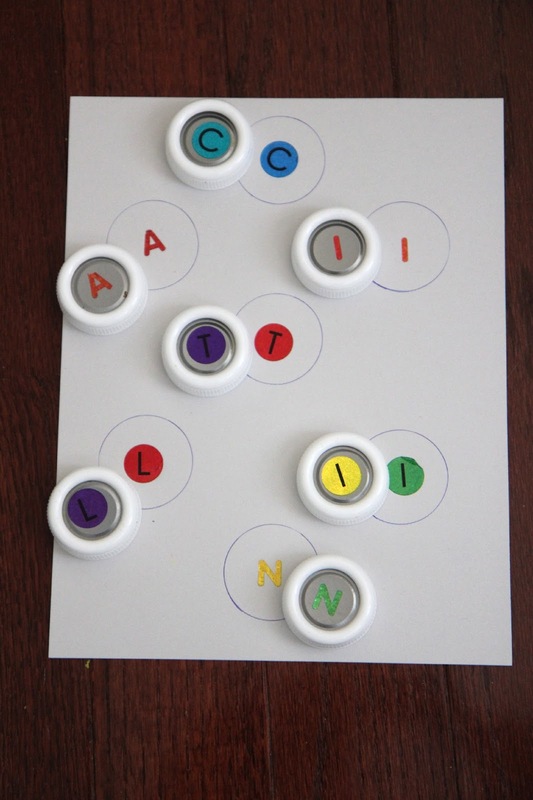 These Little Learners activities introduce simple concepts and use materials that my toddler enjoys. My toddler is currently 27 months old. This week we discovered a big bag of bottle caps in my craft cupboard. We played with them and moved them around and then we took a few of them and I created a simple matching game using my daughter's name. She is very friendly (despite having some intense social anxiety) and loves to introduce herself to people using her name. Names are so important to kids and they love talking about their names, identifying them, and learning to write and spell them too! 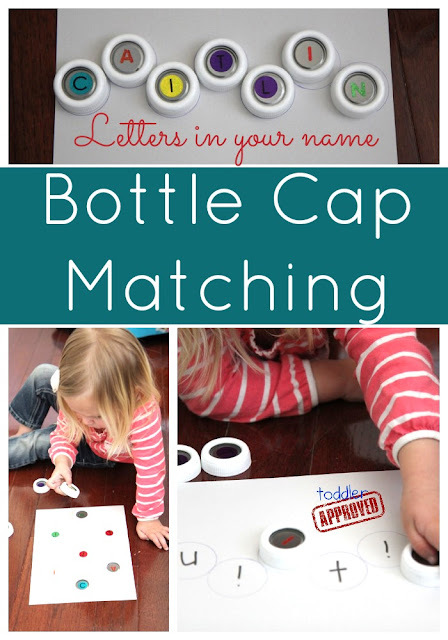 To create this simple bottle cap name matching game you just need some bottle caps and a few other supplies. 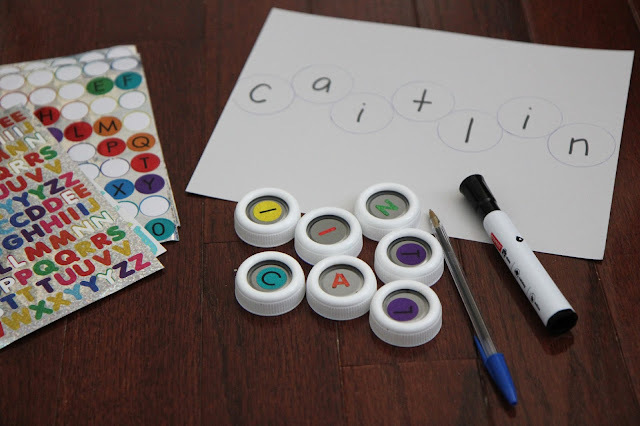 Trace around a bottle cap to make circles on your paper to match the number of letters in your child's name. My daughter has seven letters in her name, so I made seven circles. Write letters in the circles with markers or use stickers and put them inside the drawn circles. Stick alphabet letters on each bottle cap as well... one for each letter in your child's name. Our simple version just had matching stickers on the caps and on the paper. This version helped us practice simple matching skills. The letter circles were just scattered on the paper. Our harder version had uppercase stickers on the bottle caps and lowercase letters written in the paper circles. The letters were also places left to right the way a name would normally be written. This version helped us practice recognizing lower and uppercase letters and matching them in order. My daughter liked the simpler version the best, but it was interesting to see her reaction to the lowercase letters and watch her explore them a bit and comment on what each one looked like. Initially we did this activity together and enjoyed talking about the letters and colors that we saw. As my daughter got more experienced with the activity, we were able to transition it into a simple independent activity for her (while I was still close by). Once she put the puzzle together, she would move the caps off and shout, "again!" and then she would do it all over again. It was adorable to see how proud she was about making her name and talking about letters, just like her big brother likes to do. What are your favorite simple activities for Little Learners? Yes! She can... and she definitely couldn't a month or two ago because I've tried similar activities with her in the past. Every kid is different but three months is a long time and it is amazing what they can do from month to month at this age... sometimes even day to day there is huge growth. Try it out in a few months and see what happens or just try matching colors or other things your grandson likes (animals, bugs, etc.). Lillie- They are from baby formula bottles (pre-mixed). I love using them and reusing them!